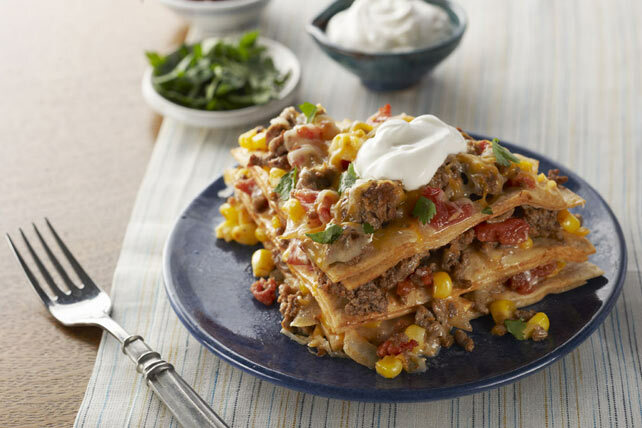 We've got everything you love about tacos - including the seasoned ground beef, veggies, shredded cheese and sour cream - in a simple, layered casserole. Our Easy Baked Taco Pie recipe is sure to become a family fave. Brown meat with onions and chili powder in large skillet on medium-high heat. Add corn and tomatoes; cook 5 min. or until heated through, stirring occasionally. Spoon 1 cup meat mixture into 1.5-L round casserole dish; cover with 3 tortillas, overlapping if necessary to fit dish. Top with 2 cups of the remaining meat mixture, 1/2 cup cheese. Cover with remaining tortillas and remaining meat mixture; cover. Garnish each serving with 1 Tbsp. chopped fresh cilantro or green onions. The cheese in this Mexican-inspired meal provides a good source of calcium.